What is an Expository Passage? 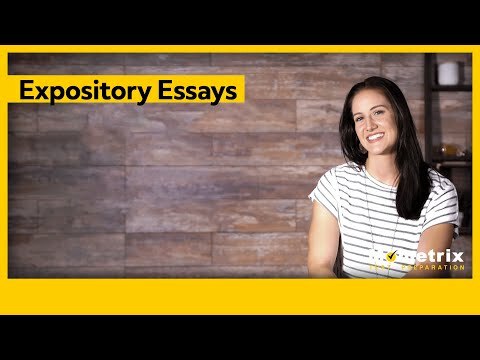 There are four different types of essays, expository, persuasive, descriptive, and narrative, and you will be responsible for learning each of them throughout your academic career. I’m here to help break that down with you and focus on the smaller picture, first. Hello, and welcome to this Mometric lesson on expository passages! An expository passage is used to teach and explain information in an objective way. To do this, authors usually write in a third person point of view, avoiding pronouns such as I or you. You can use expository passages to inform, compare and contrast, or show the cause and effect of information. It usually follows a chronological structure to help readers follow along with the ideas presented. It also reaches the points of the information quickly and as clearly as possible. A typical expository essay will be about five paragraphs, consisting of an introduction, three body paragraphs, and a conclusion. It’s important to note that the topic in each body paragraph, whether it is three or more, will refer back to the main ideas summarized in the introduction paragraph. Each body paragraph should present and explain a separate but relevant point to the main idea. If you are writing a compare and contrast essay, and you are writing it objectively, you might consider having equal numbers of paragraphs for each topic being compared. When I write a compare and contrast expository essay, I like to do one paragraph explaining the first topic, one paragraph explaining the second topic, and then a third paragraph actually discussing how the two topics relate. Of course, if you choose to include more body paragraphs, you open yourself up to many more routes for exploring your topics. When writing a cause and effect expository essay, you could take a similar approach as with writing a compare and contrast essay. You might present the topic in one paragraph, talk about the cause of the topic in the second paragraph, and explain the effect in your third paragraph. When writing a cause and effect passage, it’s important to include factual evidence to backup your claims whenever necessary. This means that you would need to do a little bit of research and properly include quotations in your essay.